A ten-cent drop in prices corresponds to a more than $1 million reduction in projected tax revenue. Soybean prices have dropped roughly 20 percent this summer, worsening an already-tough market for farmers, and setting Missouri up for an economic hit. 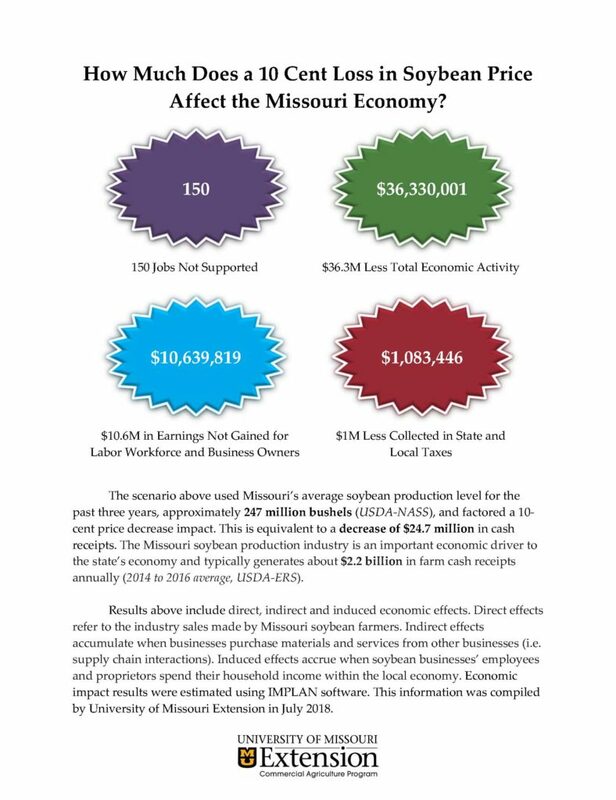 New analysis from Missouri’s Commercial Agriculture Program shows that for every ten-cent drop in soybean prices, Missouri loses more than $36 million in economic activity. Soybean prices have dropped roughly $2 per bushel over the summer, with much of the drop attributed to trade disruption with China. A $2 drop in soybean prices points to more than $212 million in lost earnings for workers and business owners, and 3,000 fewer jobs. A $2 drop in soybean prices also makes for more than $21 million fewer tax dollars collected by the State and local communities, and a $726.6 million reduction in economic activity. Each ten-cent drop in prices is also equivalent to a decrease of $24.7 million in cash receipts for farmers for the marketing year, meaning that the $2 decrease costs Missouri farmers nearly a half billion dollars. Typically, more than half of Missouri’s annual soybean crop is exported, with nearly 1 in every 3 rows of soybean destined for China. Missouri soybean farmers have raised an annual average of 247 million bushels over the past three years, according to the USDA. The analysis was completed by the Commercial Agriculture Program within the University of Missouri’s Cooperative Extension Service this month, at the request of the Missouri Soybean Association, and includes direct, indirect and induced economic effects.